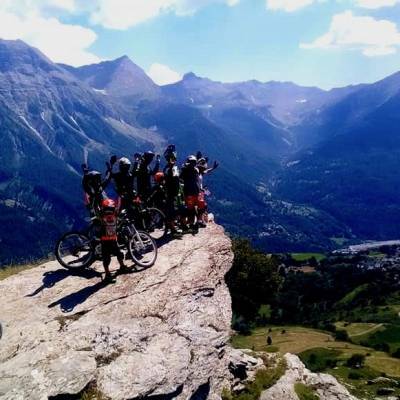 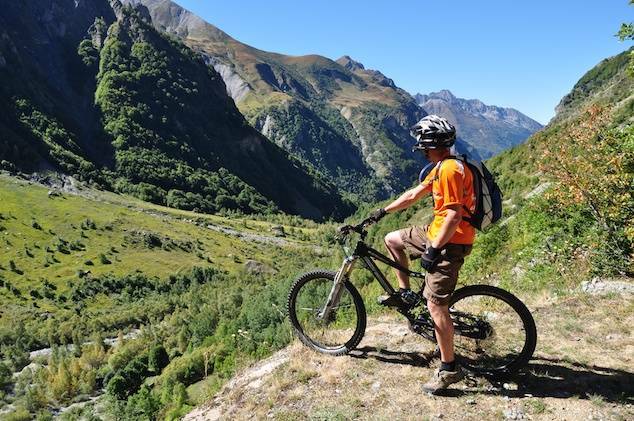 Mountain biking was invented for the mountains and it has evolved as a sport with extreme versions emphasising different aspects of the original sport with cross country biking, downhill biking, e-biking and fat biking all with their own bike types, techniques and terrains. 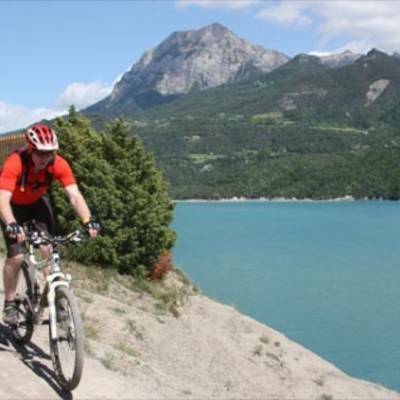 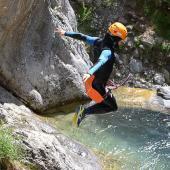 In this section, we are essentially talking about the original mountain biking sport which is now commonly known as cross country mountain biking. 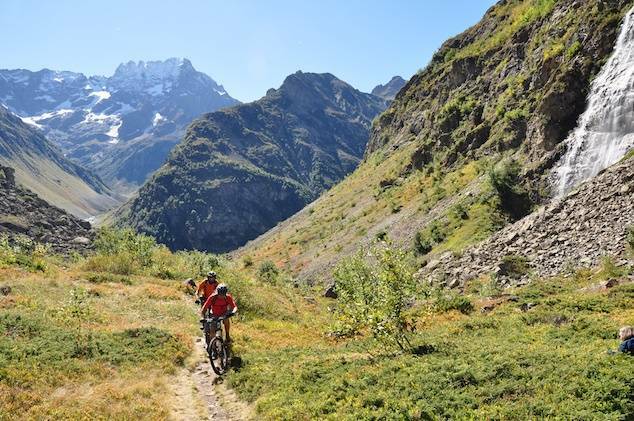 This is using a bike to ride through the mountains off road on single tracks and forest tracks, paths and whatever else is bikeable and involves both uphill and downhill! 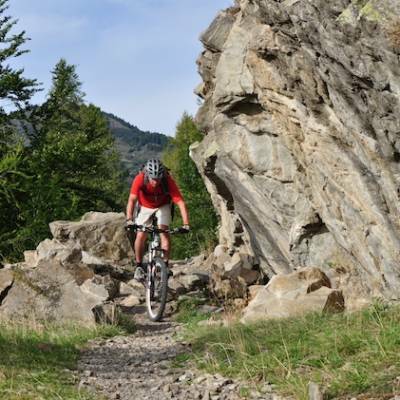 Even within the sport of cross country mountain biking, there are a wide range of different bike types. 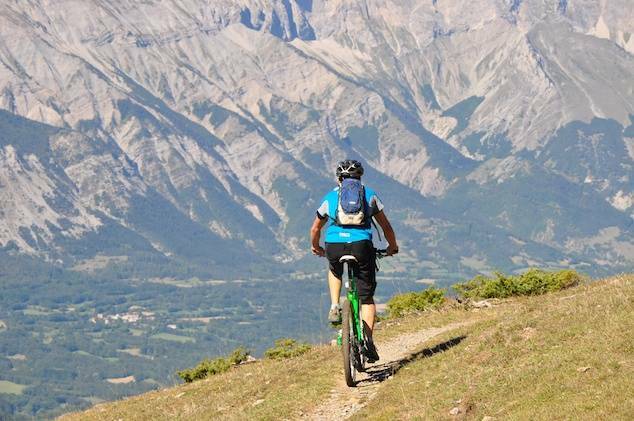 Essentially they all have knobbly tyres to grip in mud and other off-road terrain, some form of suspension to absorb those bumps, generally wide handle bars, high gear ratios for going up steep hills, most have disk brakes and they tend to be quite light. 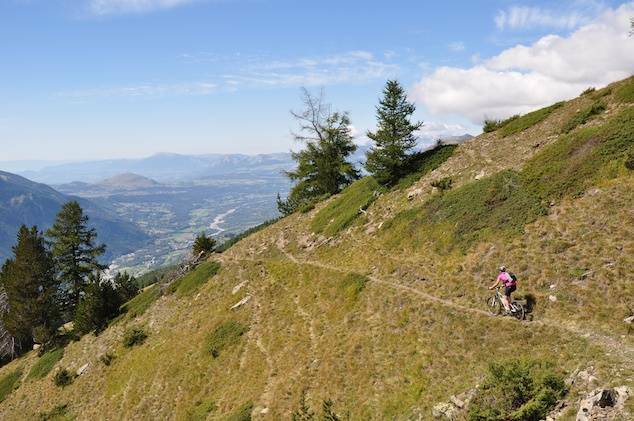 There is a compromise for cross country mountain biking as you want light and less suspension for going uphill and heavy with lots of suspension for going down. 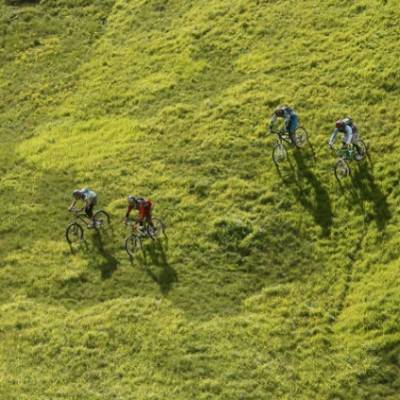 In effect cross country bikes meet in the middle somewhere! 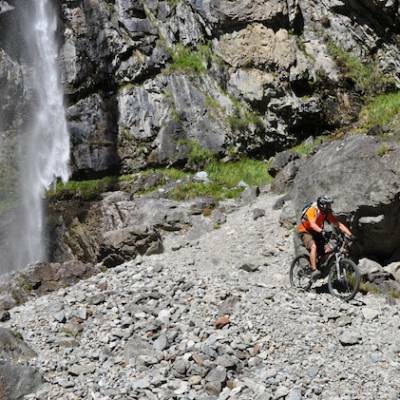 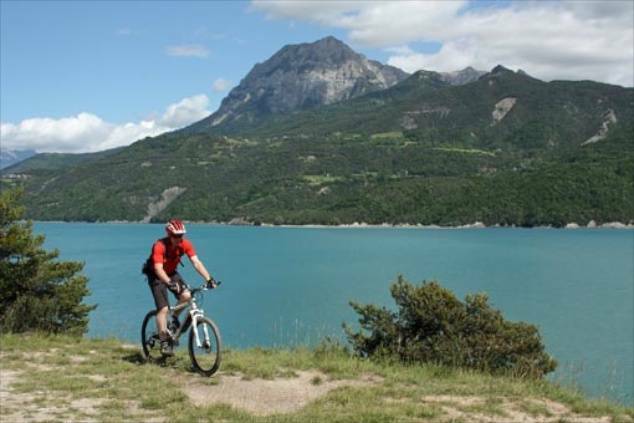 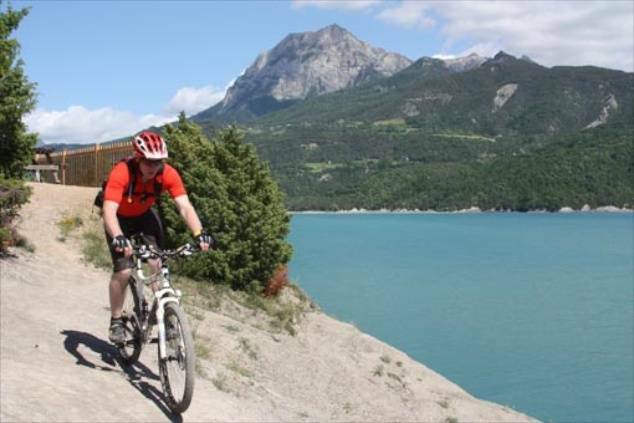 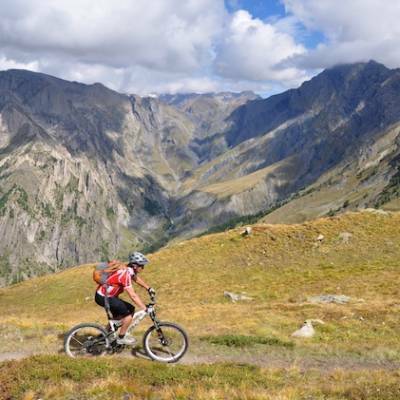 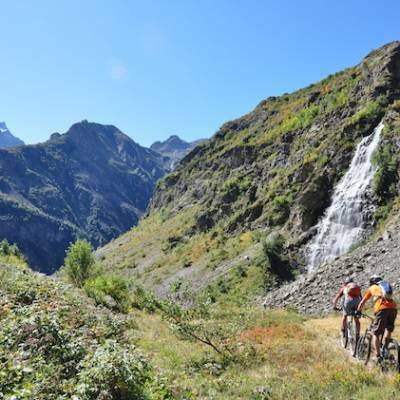 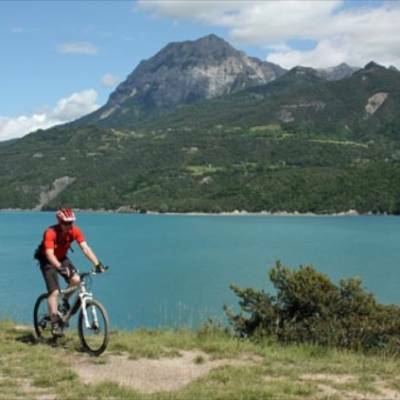 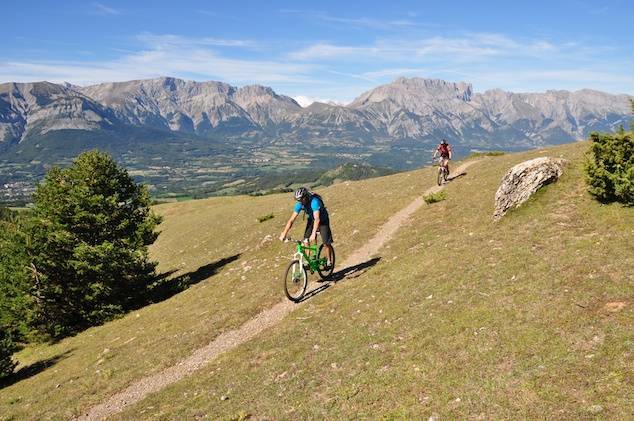 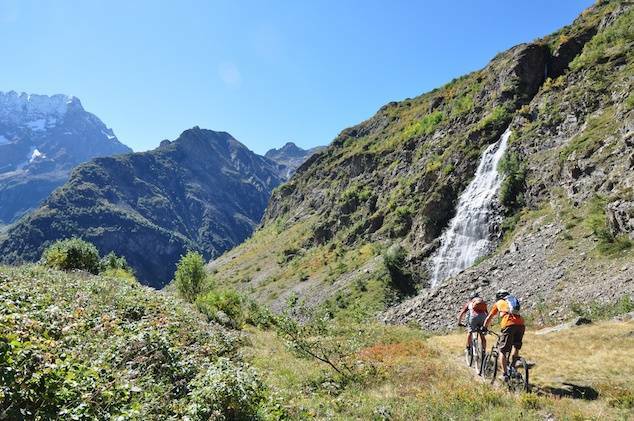 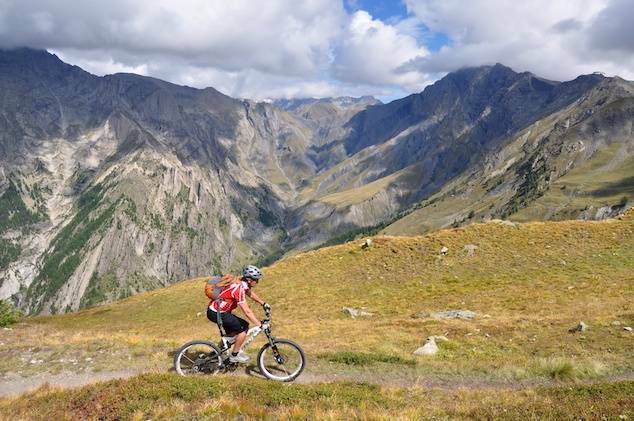 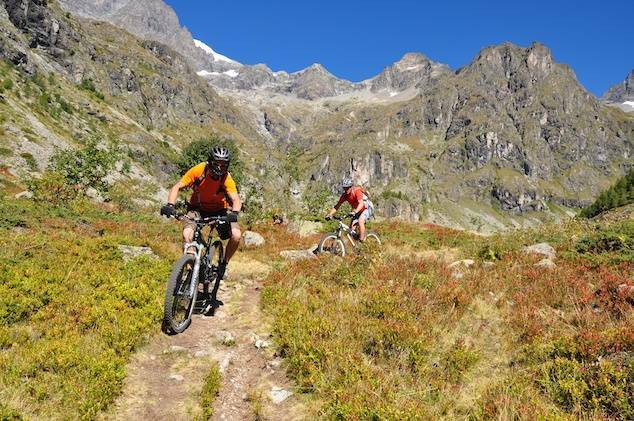 You need a reasonable level of fitness to go mountain biking in any mountain range and the first tip is to prepare your route. 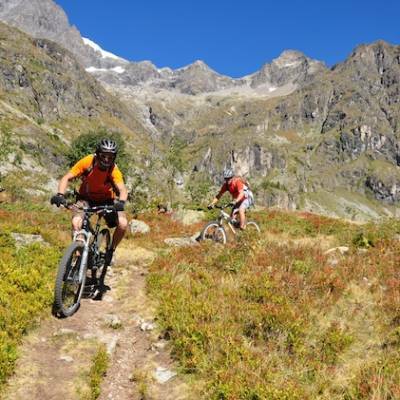 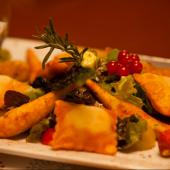 Where possible use way marked routes for ease of navigating and choose one that is suitable for your level of fitness. 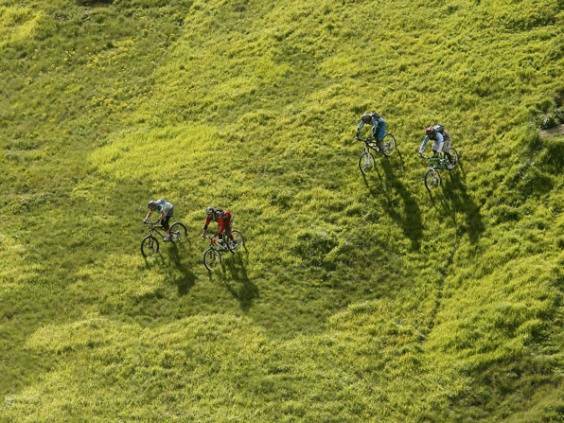 Once biking it is important to look up and read the trail in front of you to pick the best line with the least obstacles and pace yourself. 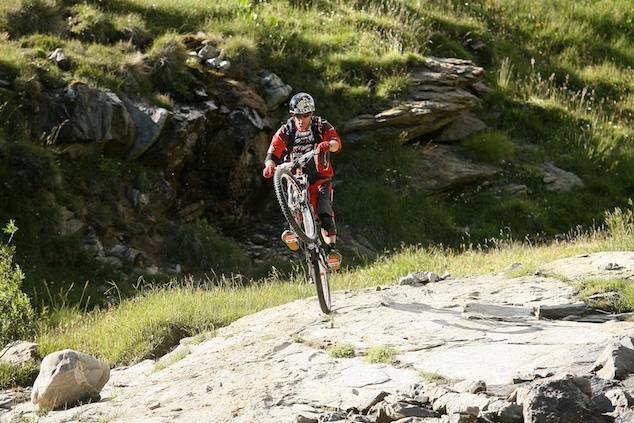 Actual biking technique is all about body position weight transfer and balance. 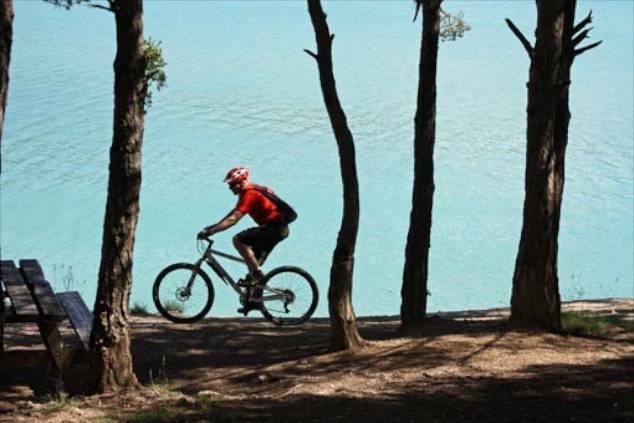 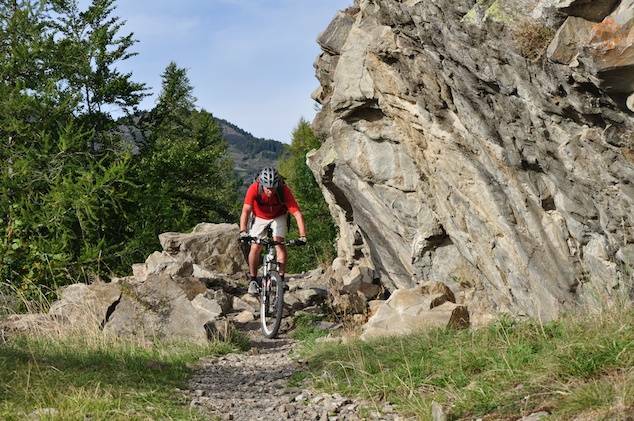 Read more on mountain biking technique on our blog! 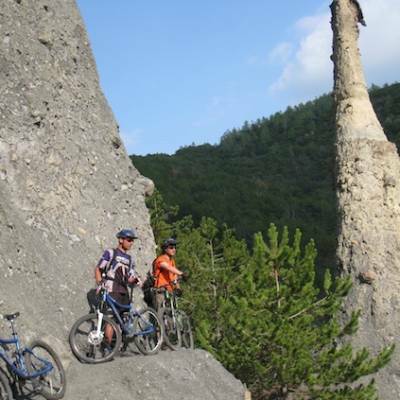 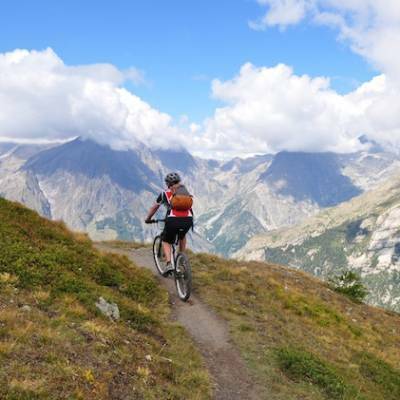 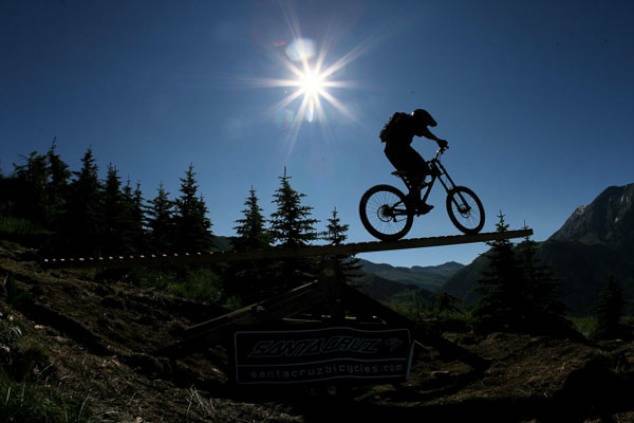 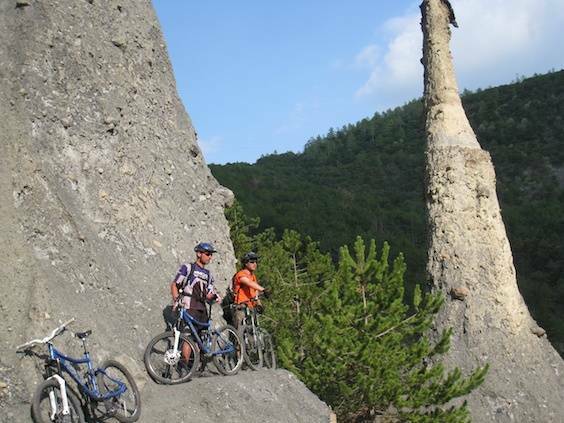 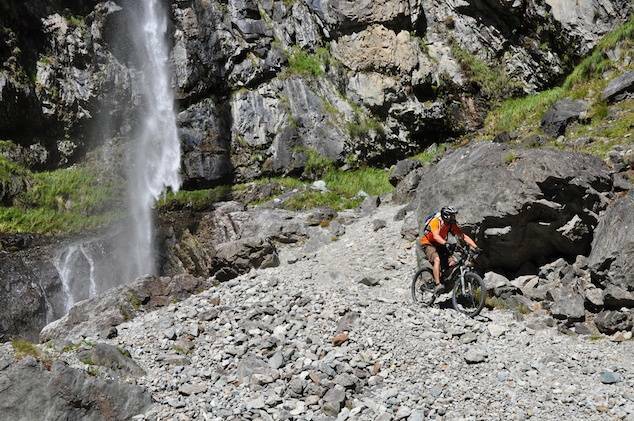 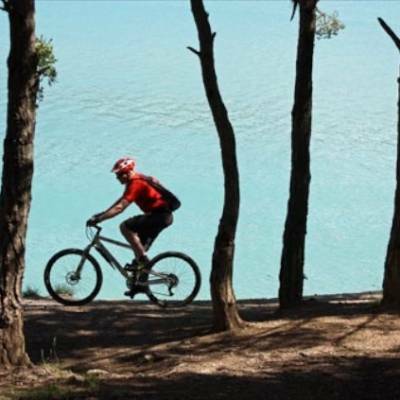 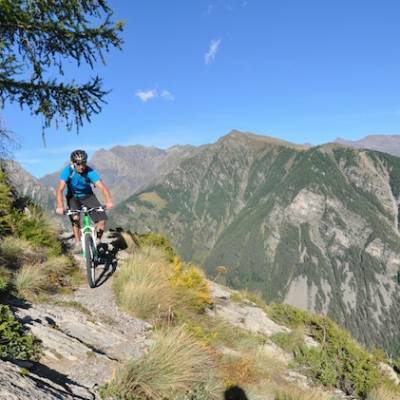 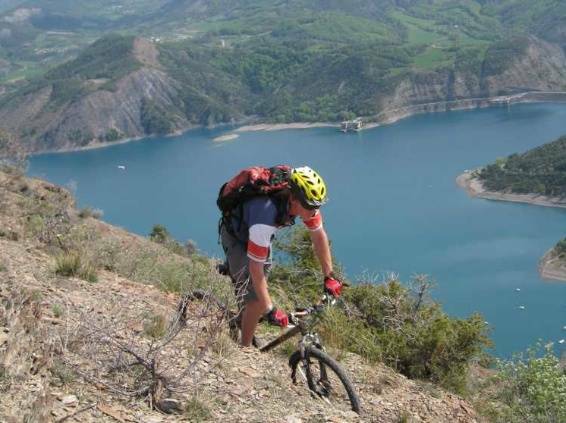 If you are looking for pure downhil biking thrills, choose a purpose built downhill biking area. 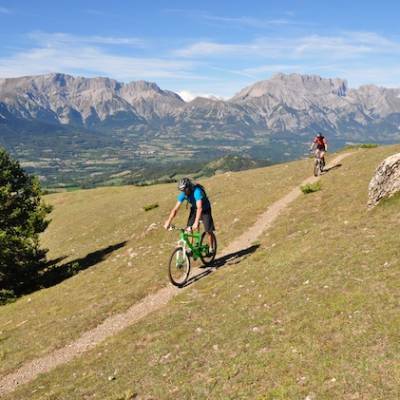 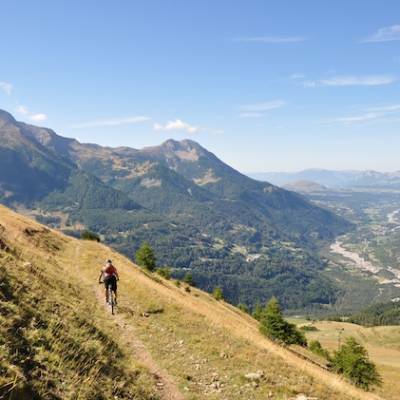 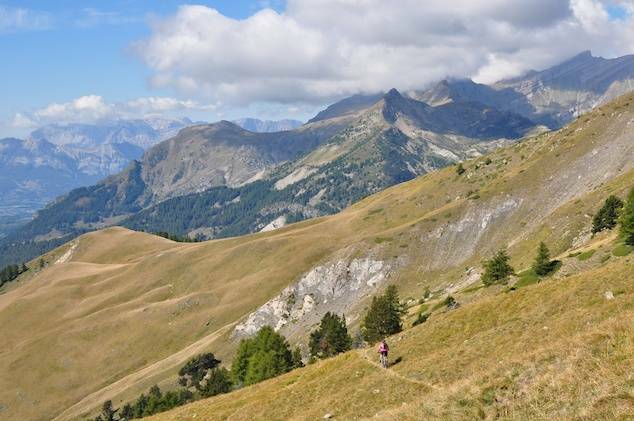 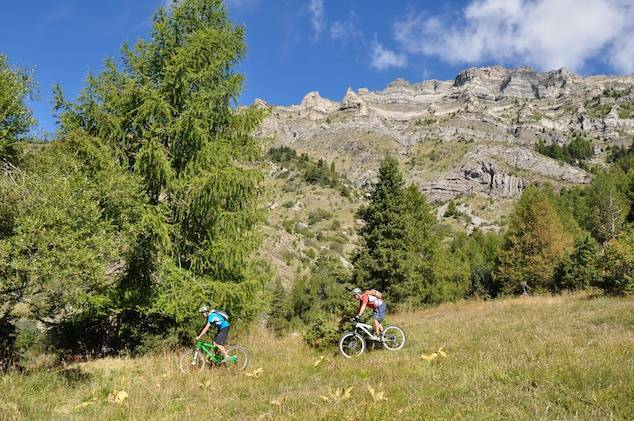 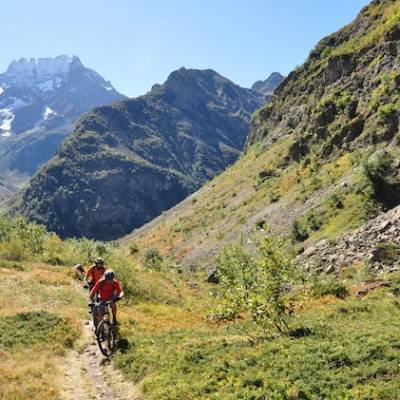 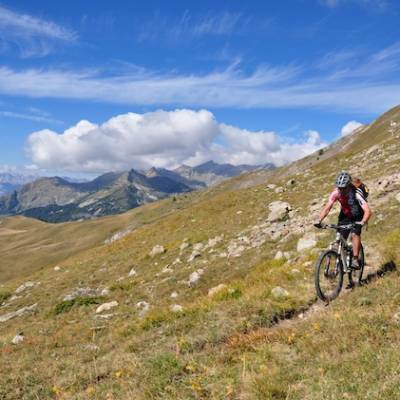 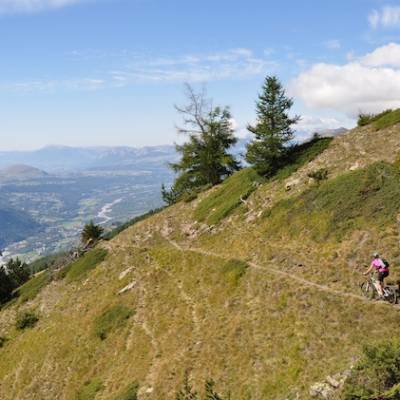 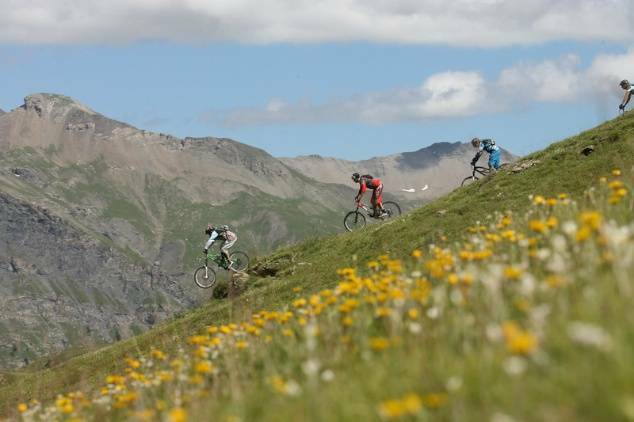 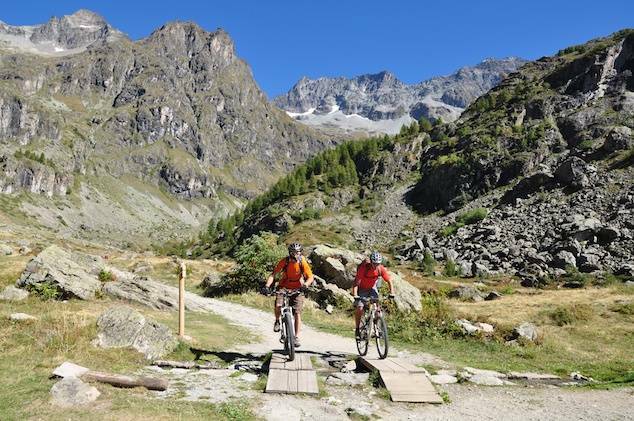 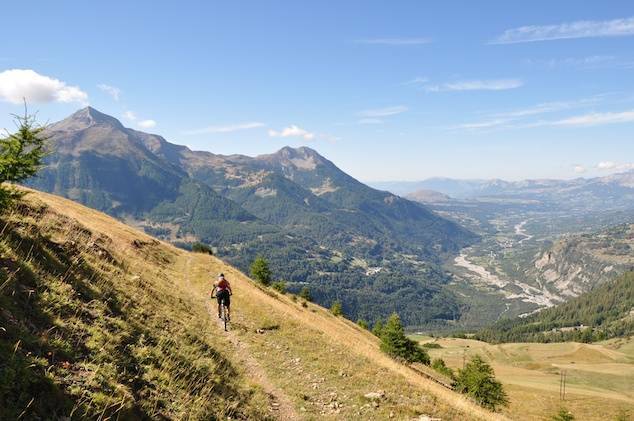 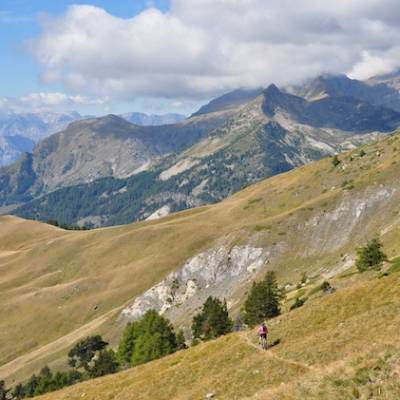 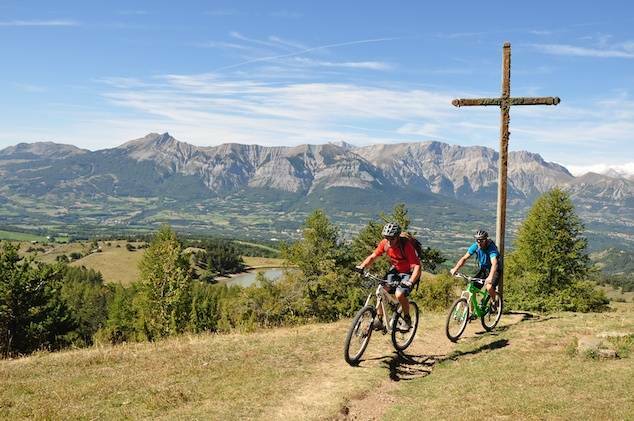 Many ski resorts offer lot access to their summer pistes now with specially made and managed tracks with banked turns and bumps, a downhill bikers dream! 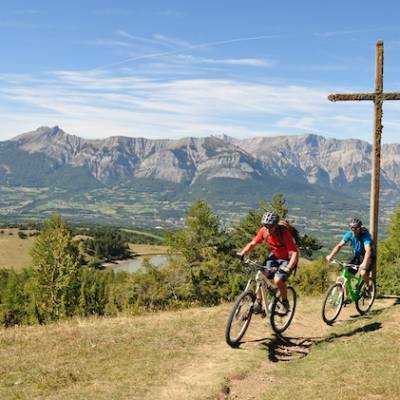 Some place also offer shuttle transfers to the tops of mountain passes so you in effect do the descent of a cross country route. 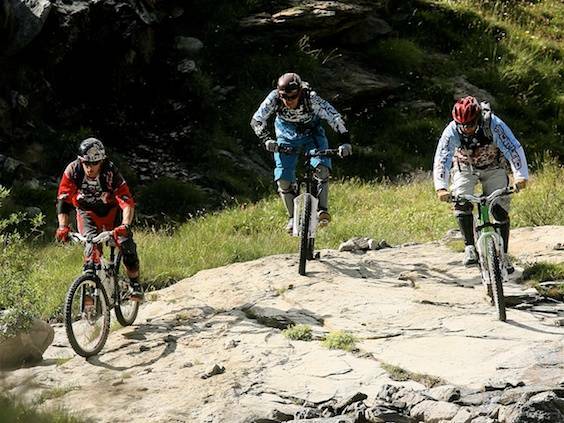 Downhill biking is now a sport in its own right so we have a dedicated page for it. 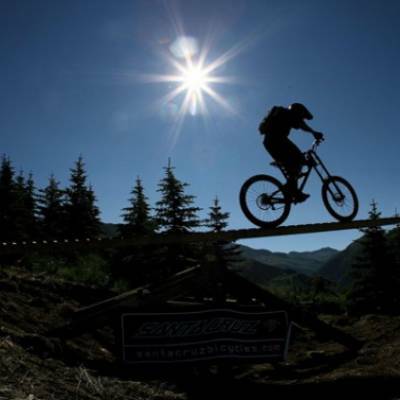 Please look up our downhill biking page for more information. 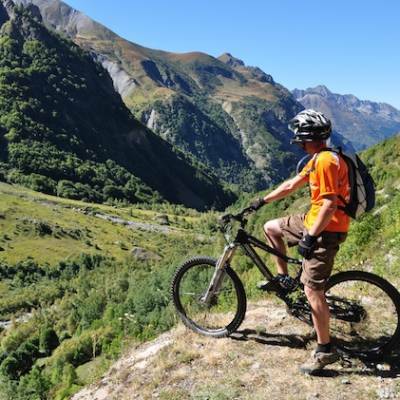 The electric mountain bike has also become exceptionally popular. 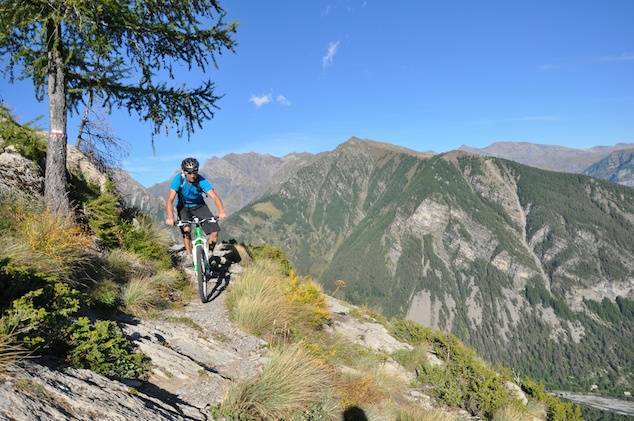 Full suspension mountain bikes equipped with an electric motor for that extra bit of umph so you can get your downhill thrills with a little less effort! 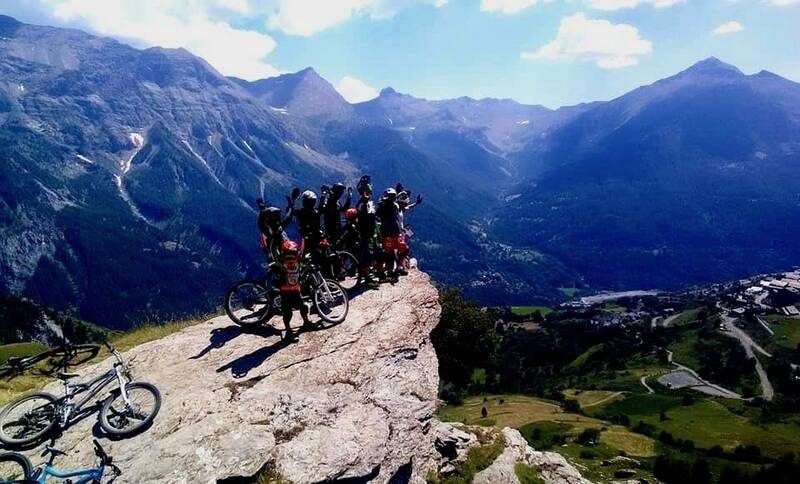 The mountains are yours to play on! 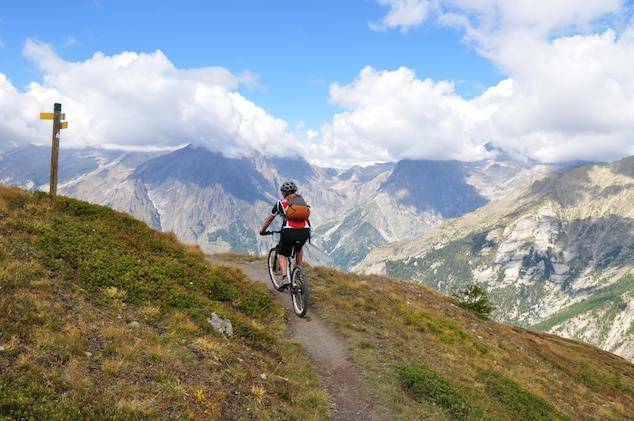 You turn the power on when it's a little bit difficult and turn it off to pedal harder when you want to exercise. 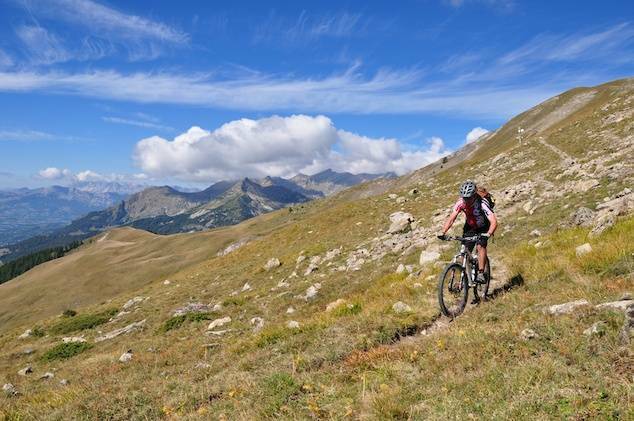 Technology has advanced exponentially in this area and it's sometimes hard to tell the difference between an electric and classic mountian bike. 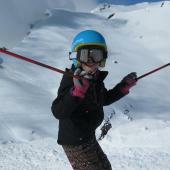 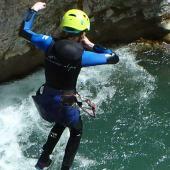 For mixed ability groups it is also a great way of sharing the same experience. 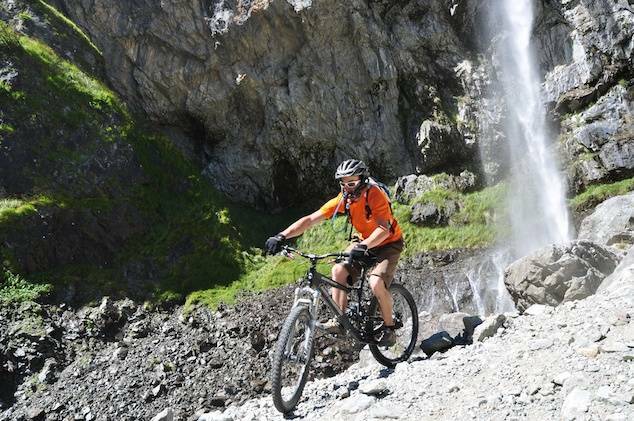 So Grandpa can now keep up with his teenage mountain bike enthusiast grandson and no-one will be any the wiser! 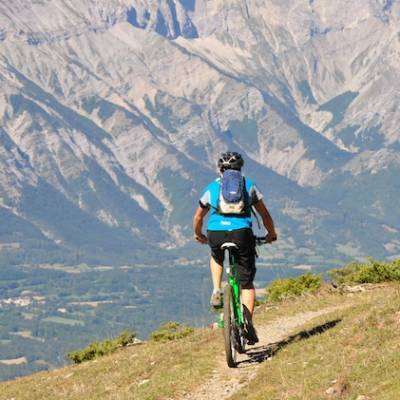 Fat biking is another phenomenon. 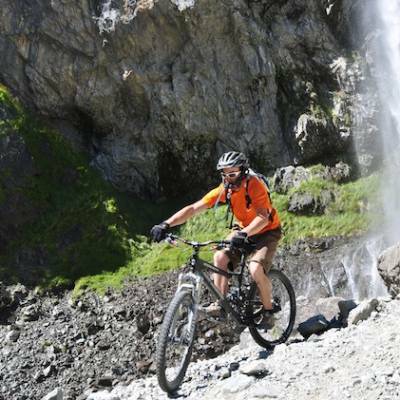 With great fat tyres to absorb the worst lumps and bumps and for amazing grip, these bikes are great in snow and any off road terrain. 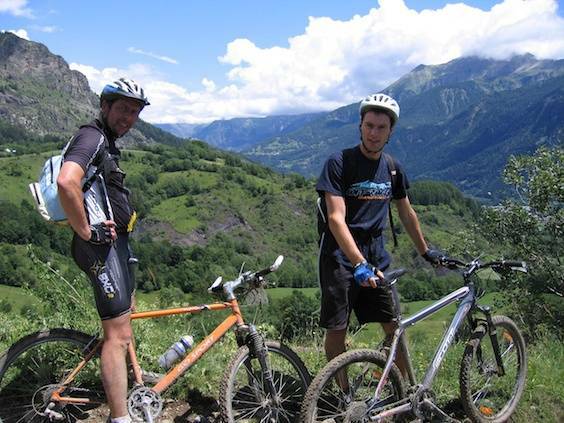 They are also great for beginner mountain bikers as they are more stable than classic bikes.